You need more storage space. Maybe a car, general garage storage, a boat, a convertible you only get to use part of the year, snowmobiles, jet skis, bikes, tools, etc. And your garage isn’t cutting it anymore either at home or at the cabin. You need a container garage. Containers are great garages. They can store a ton, are reasonably price, easy to install, easy to maintain and easy to use. 1. Containers can store a ton (or actually 24 tons!). A 20’ container is roughly the size of a one-car garage. You can store cars, trailers, tractors, boats, and all sorts of fun toys that make every season fun. 2. Containers are reasonably priced. Even with containers being a little higher price than they were even 5 years ago, they are still a great deal. They cost less than building a garage. However, depending on where you need the container, there may be delivery fees to consider. 3. Containers are easy to install. 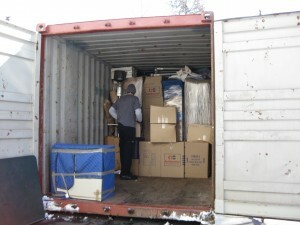 Have a container delivered on a tilt-bed truck and it is ready to use immediately. You want to pick a location that is firm ground – ideally paved or gravel – that is reasonably flat and has enough room for a tilt-bed truck to get into. Tilt-bed trucks deliver the container by pulling out from under them, so you will need the length of the container plus the length of the truck for clearance. If you don’t have firm ground, consider putting down gravel to create a good base. 20’ containers weigh 5,000 pounds and 40’s come in just under 10,000 pounds, and you don’t want them to sink! If you want blocking under that, no problem! We recommend 6”x6” blocks (2’ long each). 4. Containers are easy to maintain. If you look through your container 1-2 times per year, checking on any rust that develops and addressing the rust before it goes all the way through your container, your container will last for many years to come. Some people will put roofing tar on the top of the container as an extra moisture barrier for the roof to extend the roof life. 5. Containers are easy to use. Once your container is in place, they have two doors on one short end that open up to allow access the full width and height of the container. If you don’t like using those doors, consider adding a roll-up door or service door for additional access. We have kits or can install them for you. If you are driving in items, you will want a movable ramp. Container doors lock into place by having lockrods lock the door in place below and above the doors, so you don’t want a permanent ramp that doesn’t allow the door to swing open. But a movable ramp will let you easily drive in and out of the container. The possibilities are endless. Containers are versatile enough to store all your toys!